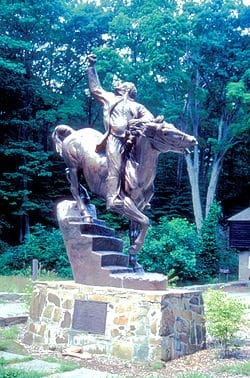 Putnam Memorial State Park is named for Major General Israel Putnam who chose the site as the winter encampment for his men during the winter of 1778/1779. 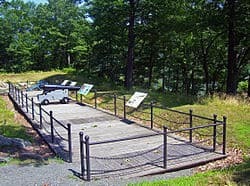 The former American Revolutionary War encampment and park is located at the intersection of Route 107 and Route 58 in Redding, Connecticut, in the United States of America. It is Connecticut’s oldest state park, established in 1887 by Redding resident Charles Burr Todd. Over 3000 men were sent into winter quarters spread throughout three camps in Redding. 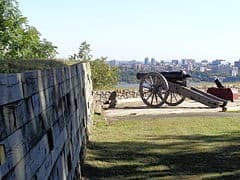 The camps were established to keep an eye on the storehouses in Danbury, Connecticut, and to protect Long Island Sound and the Hudson River Valley. Many of these men were the same who had suffered at Valley Forge the previous winter. 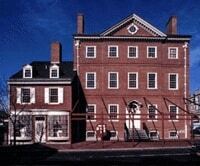 The 2nd Canadian Regiment, or Congress’ Own, under the command of Moses Hazen and the 2nd New Hampshire Regiment under the command of Enoch Poor were stationed at the current park. The park also has picnicking, pond fishing, and ice skating.